Paleontologists have identified a pair of beaver teeth believed to be the oldest ever discovered in North America. Found near Dayville, Oregon, in northern Oregon's Rattlesnake Formation, the teeth closely resemble those of modern beavers, suggesting that the toothy rodents have changed little over the last 7 million years. At 7 to 7.3 million years old, the teeth are at least 2 million years older than ancient beaver remains previously found elsewhere in North America. Beavers as we know them are believed to have emerged in what is now Germany, approximately 10 to 12 million years ago. It's thought that the semi-aquatic rodents eventually made their way to Asia, and then to North America by crossing the Bering Land Bridge. Early European explorers in North American were amazed to find heavy concentrations of beavers, which had already been hunted close to extinction in the old world. The creatures were widely dispersed throughout the newly discovered continent. Known for their remarkably sharp incisors and their ability to fell trees, build dams and construct habitable lodges, beavers are some of the most notable modifiers of their environment, perhaps second only to man. Although some critics have suggested that their activities are harmful, new evidence suggests that their behavior is actually beneficial to local ecosystems. 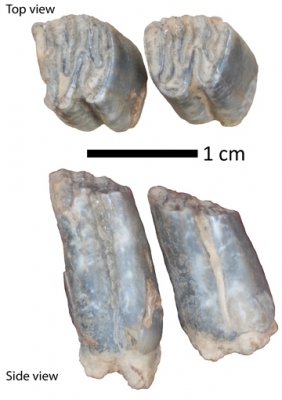 The newly discovered fossilized teeth help clarify scientist's understanding of when the modern Eurasian beaver (Castor fiber) diverged from today's North American beaver (Castor canadensis). The teeth suggest that this divergence occurred earlier than had been suspected. Previously, the oldest known examples of ancient beaver remains, discovered in Nebraska, California and northern Oregon, were about 5 million years old. The new teeth will be on display at the Thomas Condon Paleontology Center, at John Day Fossil Beds National Monument, in northern Oregon. Appropriately, Oregon is known as "the beaver state"; its official state animal is the beaver.